Many real estate institutes around the world are starting to recognize that rent to buy systems are becoming a viable alternative for many house buyer. The term rent to buy has many variations to its meaning so let’s cover what the most typical meanings of this term. Rent to buy may be right for you if you do not have many cash, but still want to buy eventually. With a rent to buy deal you; do not have to pay closing costs or a down payment. You are working more likely as you are renting a property. This is a great deal because you can one day own a home, but you will not have to spend many upfront cash. This the main reasons that rent to buy real estate have become so popular lately. It is usually a biggest decision when people come to this issue between renting versus buying. Really, it is an extremely tough choice to choose between the two options. Sure, buying a house takes tons of paperwork and involves commitment to that house. However, in the long time, owning a home is extremely important since your home is one of the biggest investments you can make. Here is rent to buy scheme can connect the issue between renting and buying. What are the benefits with Rent to buy scheme? Rent to buy can motivate seller or investor makes the home available without the need to qualify for a normal bank loan. Normally this means that the seller will allow the tenant to purchase the home with regular principle and interest installments over a period, so that the tenant will become the owner over time. Here is tenant can become owner of the house, that what I mean about connect between renting and buying. Regarding the rent to buy scheme, specifically for rent to buy in Australia, There is an online site www.ownyourhome.com.au that can give you opportunity to take a home with rent to buy scheme. What are the opportunities that offered by this site? You can own your home by rent to buy scheme. They will help you to refinance your loan and will recommend the lenders that familiar with their concept. If the bank cannot refinance, so they will cover you to finance until bank allow you to refinance. The goal is to help you to own your home by giving you easy systems: rent to buy scheme. 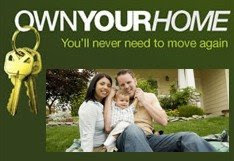 OwnYourHome.com.au is owned and managed by Pitline Pty Ltd, a family business that has specialized in assisting individuals and organizations manage their finances since 1991. Just visit and look around. gadis rantau mau tinggal didusun aja kang. gak mau ke LN lagi.hi..hi..
@Kristina:Sama mba sy juga lebih sk di dusun nih..
@Tony : yup, makasih mas sukses selalu juga..
lam kenal yah...hehehehe, aku aja sekarang masih ngontrak kok kang. ya ggp mas..thanks for comment bro.. Yes that is correct. Rent to buy is a good method since it provides a home to many people. Plus it is safe and secured.